UNBHockeyFans.com: REDS ARE CHAMPIONS ONCE AGAIN! There will be another National Championship banner to hang from the rafters of the Aitken Centre in September. 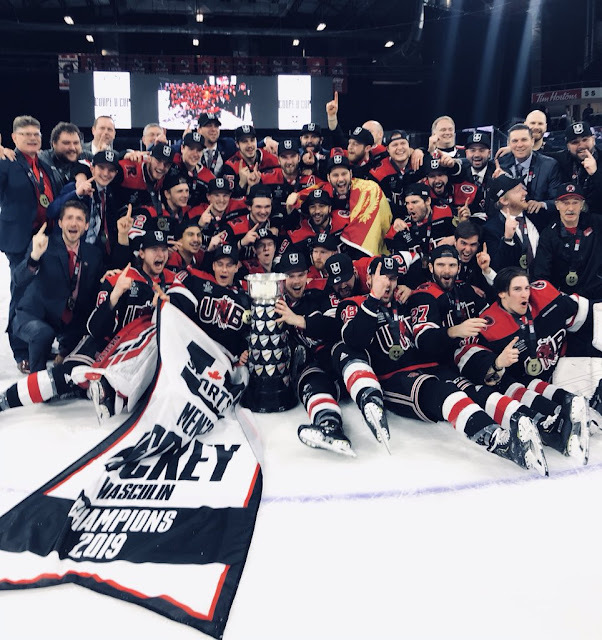 The University of New Brunswick Reds capped a memorable season by defeating the defending champion Alberta Golden Bears 4-2 in a heavyweight match-up tonight in Lethbridge to capture their 8th University Cup in school history - and their 3rd in four years. The Reds came out strong and dictated play for the majority of the game's opening minutes, but the Golden Bears got a power play - which would be the theme of the opening period - at 3:53 and they only took 40 seconds to strike with Brandon Magee finding Steven Owre all alone at the backdoor for a shot into a gaping cage that Alex Dubeau had no chance on. It was Alberta's first shot of the game. The Reds quickly responded, however, when Mark Rassell intercepted a break out pass just inside the Bears blue-line and fed Samuel Dove-McFalls down low. The rookie forward made a quick deke and slid the puck between Zach Sawchenko's pads to knot the game at one. The Bears suffered a huge blow mid-way through the period when U Sports player of the year Luke Philp crashed hard into the boards and left the game without putting any pressure on his left leg. He would not return and his absence was immediately felt as the Reds were assessed eight minutes of penalties - including a controversial double minor for high-sticking - in just under five minutes late in the period, giving the lethal Golden Bears power play a golden opportunity to take the lead. The Reds penalty kill was put to the test and they rose to the occasion just like they have so many times this season. Although Alberta generated a number of shots on goal, they could not solve Dubeau and the game remained 1-1 through twenty minutes. UNB out-shot Alberta 16-12 in an exciting opening period. Each team came up empty on abbreviated power plays early in the second period and the game would remain deadlocked until late in the frame. At 14:27 Matthew Boucher and Oliver Cooper did some good, hard work behind the Golden Bears net, which resulted in Boucher winning the puck and getting it back to Randy Gazzola at the blue-line. Gazzola floated a wrist shot towards the net that Cooper was able to get a stick on to deflect it past Sawchenko for the tie-breaking goal. The Reds then got a rare power play just under three minutes later and it only took them 12 seconds to extend their lead with Kris Bennett (Simpson, Boland) getting the puck at the goal line, spinning to his forehand, and putting it upstairs. Bennett's 5th goal of the tournament gave UNB a 3-1 lead and that is how it would remain after 40 minutes. Shots in the period were 13-12 for the Reds. As expected, Alberta threw everything they had at UNB in the 3rd period with their season on the line. They made thing interesting at 6:47 when Grayson Pawlenchuk stole the puck from a fallen defender in the Reds corner and got it out front to Brandon Magee, who shot back against the grain as Dubeau was moving from his left to right. At 10:57 the Reds got a huge insurance goal to give them some breathing room. Mark Rassell broke down the left side and took a sharp angled shot that found the top corner to make it 4-2. From there it was all about protecting the lead and milking the clock. The Reds seemed perfectly content to slow the game down and take as many icings as necessary over the last five minutes to drain the clock, relying especially on Mark Simpson to win the ensuing offensive zone face-offs. The Bears pulled Sawchenko with over two minutes remaining, but couldn't muster much more than a couple of scrambles in front of Dubeau before the clock hit 0:00, giving the Reds an 8th University Cup championship. Alberta held a 10-2 shot advantage in the period. - The Reds went with their usual line-up, meaning Noah Carroll, James McEwan, and Patrick Watling were scratched. - Alberta ended up out-shooting UNB 34-31 in the game. The Reds had more shots (10) in the opening 12 minutes of the game than they did in the entire 2015 final against Alberta (9). - UNB was 1 for 3 on the power play. Alberta was 1 for 7. - Alex Dubeau was sensational once again in goal, including making a huge sliding glove save at the left side of his net to keep the score 3-1 early in the 3rd period. - Rassell and Magee were the players of the game. - After playing the best hockey of his UNB career this weekend, Alex Dubeau was named the recipient of the Major W.J. 'Danny' McLeod Award as the tournament MVP. - Joining Dubeau on the tournament all-star team were defenceman Marcus McIvor and forwards Kris Bennett and Chris Clapperton. Alberta's Jason Fram and Luke Philp were the other two players named to the team. - This is the first time in four tries the Reds have beaten Alberta in a gold medal game. - This is the second time they have defeated the top seeded team in the final. They also accomplished this in 2007 against Moncton. - Seniors Randy Gazzola, Cameron Brace, and Matt Boudens cap their excellent five year UNB careers with a 3rd national title. They also have a silver medal and bronze medal to their credit. - Gazzola and Boudens played in the maximum 15 University Cup games over their university careers. - UNB's 15 goals scored this weekend are the most they have ever potted in a University Cup-winning tournament. They netted 17 last year, giving them 32 in their last six tournament games. - They out-scored the opposition by 11 goals (15-4), which is their best ever at the tournament. - UNB has now won a University Cup in five different provinces - New Brunswick (3), Saskatchewan (2), Ontario, Nova Scotia, and now Alberta. - This is Gardiner MacDougall's 100th career postseason victory, which includes 69 AUS playoff wins plus another 31 University Cup wins. - The Reds went 8-0 in postseason play this year. It is the first time they have ever gone undefeated through the AUS playoffs and University Cup. - Of course, this now begs the question - Is this the best UNB team of all-time? A 4-2-0 exhibition record, a first place 25-2-3 regular season record, a 5-0 playoff record and an AUS title, and a 3-0 University Cup record with a gold medal for an overall record of 37 -4-3 this season. It is certainly in the conversation. - Next up for the Reds is the offseason, but keep checking in for the latest news and updates throughout the summer. - Hockey season is only six months away!